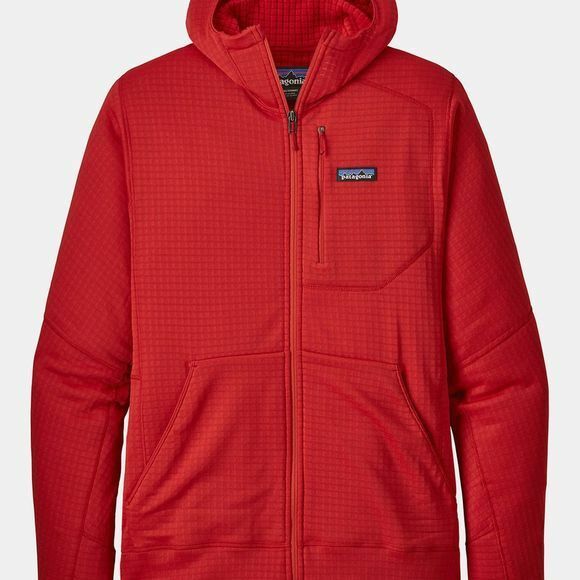 The Mens R1 Full Zip Hoody from Patagonia is created to handle any cool-weather adventure. Its exclusive Polartec Power Grid fabric traps heat while remaining highly breathable and lightweight, and has outstanding stretch and durability. The snug-fitting hood stays comfortable under a helmet and the front zipper finishes with a soft kissing-welt garage at the chin for next-to-skin comfort. A range of pockets ensures you can safely carry the esentials: one zippered left-chest and two drop-in low-profile handwarmers. The stretchy cuffs push up comfortably over your forearms. With Polygiene permanent odor control.